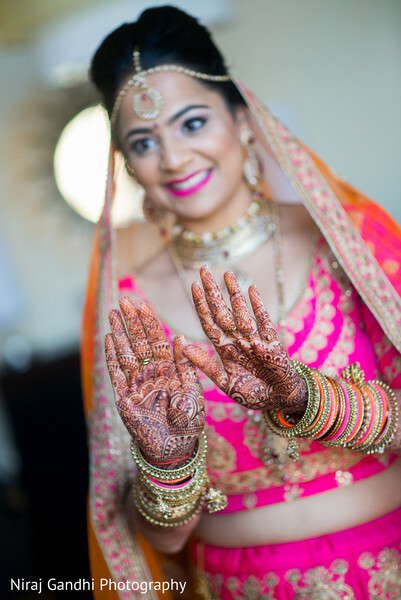 Romance took center stage at Palav and Arpit’s vibrant Indian wedding. Palav told us, “I don't think there was one specific moment where I knew he was "the one." It was more an accumulation of the little things he did throughout our relationship. For example, he sent me an Amazon package of soup, Cheez-Its, and Gatorade when I had to stay home from work sick. Or all of the times he does the dishes and helps me clean without even me asking; he really views our relationship as an equal partnership which I absolutely love.” Adorable! What better way to kick off the work week than this duo’s festive and colorful celebration. Maharani Palav got dolled up by Tai Goodrich - Beautification Transformation with a bouffant ‘do and bombshell makeup. 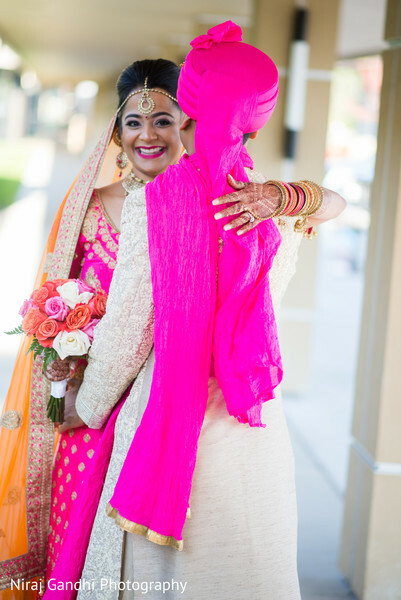 The bride donned a multifaceted orange and hot pink lehenga that channeled tropical Bollywood glam. 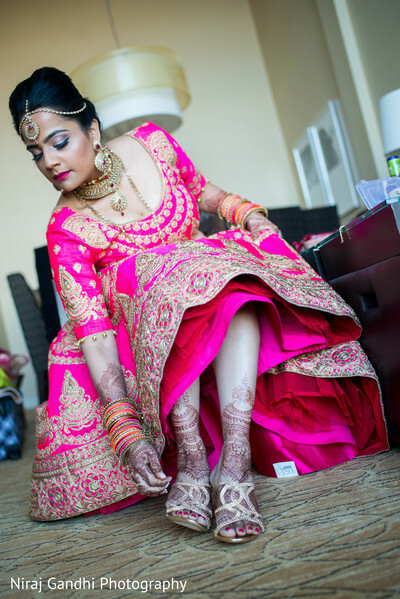 She was total eye candy as she met her dapper beau Arpit on the grounds of the Chicago Marriott O'Hare for their darling first look. The sweet glances of love between these two made our inner brides squeal in glee! 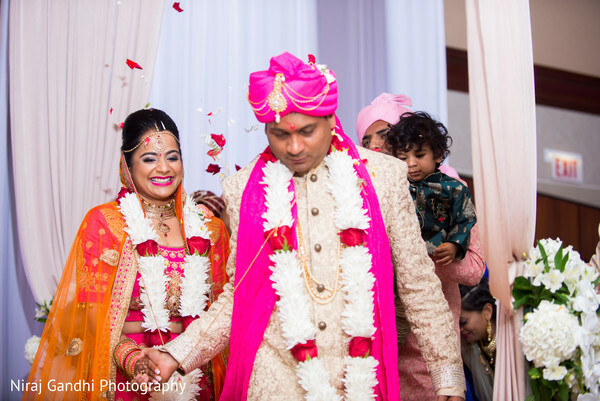 Soon, Arpit’s epic baraat entrance swept through the streets of Chicago to kick off the auspicious proceedings. 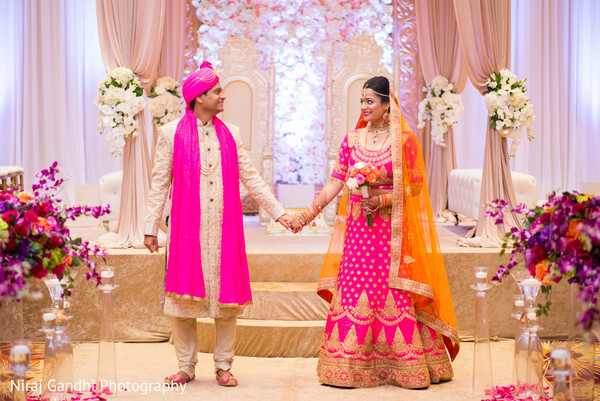 As guests tricked into the ballroom, they gasped in pleasure over the spacious room transformed into a romantic heaven with a pink, canopy mandap with a wall of lush blooms created by Elegance Decor. After the ceremony, the couple’s loved ones bid the newlyweds farewell in a shower of rose petals, tears, and hugs. 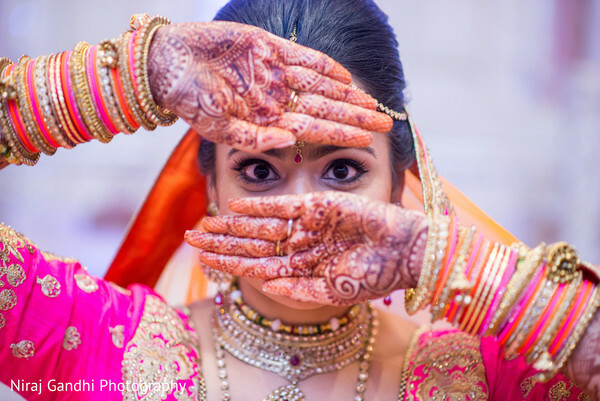 Niraj Gandhi Photography captured all the charming photos you can find in the full gallery. And make sure to scroll below for our exclusive interview with Maharani Palav. It was the summer of 2015. I had moved back home to the exciting suburbs after graduating from residency. I was studying for my internal medicine boards while enjoying some time with family. Arpit was living in the city during this time. I was taking a study break and decided to log in and check my shaadi.com profile for any messages. I saw a message from Arpit; it was detailed and genuine and I responded. After a few messages exchanged on the website and numerous text messages, Arpit asked me out to dinner. He knew I was in the suburbs for the summer, so he offered to drive there for my convenience (so sweet!). We met at a winery half way; the conversation was flowing more than the wine and the chemistry was apparent. Arpit did a really good job of following up and texting the following day and we continued to text throughout the week and met up for a second date in the city. The more time we spent together, the deeper our connection grew. Before we knew it, our families were meeting and we were engaged! I don't think there was one specific moment where I knew he was "the one." It was more an accumulation of the little things he did throughout our relationship. For example, he sent me an amazon package of soup, cheez-its, and gatorade when I had to stay home from work sick. Or all of the times he does the dishes and helps me clean without even me asking; he really views our relationship as an equal partnership which I absolutely love. My favorite memory is when he first met my family and how well he got along with them. He really values family over everything, which was an important quality to me. We flew into Naples, Italy on August 6th 2016 and took a car to the Amalfi Coast. We stayed in an Air BnB and our host was so accommodating. Arpit went out to talk to him about our stay, and I thought nothing of it. That night, we had planned a private boat sunset cruise and a dinner afterwards. We got ready and headed down to the beach. As we got on our boat, there was the captain and one other person. Arpit told me this gentleman was part of the docking crew and he would also be joining us. The boat started to sail into the bluest waters I'd ever seen. Before I knew it, Arpit was sitting next to me and the sun was about to set. He got down on one knee and proposed! That extra dock crew member turned out to be a professional photographer he had hired along with champagne, a bouquet of roses, and a special cake!! I was in awe; the moment felt like something out of a fairy tale. We immediately called our families to share the good news; everyone was so ecstatic! Little did I know, Arpit had been planning out all the details with the boat company, the flower shop, the bakery, the photographer, and our AirBnB host for months via WhatsApp. And to top it off, when we returned to Chicago, Arpit had arranged a surprise party with both families at my brother's apartment. It couldn't have been a better way to end the amazing trip! My older brother had just gotten married the year prior, so we had a pretty good idea of what we needed to do. 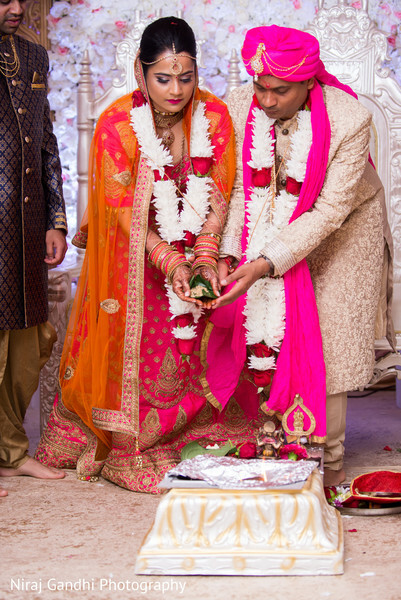 Arpit and I wanted to be 100% involved with our wedding and plan the entire 3 day event ourselves-without the help of a planner. It took numerous google docs, hundreds of edits to the timelines, and so many checklists for each event. We had phone conferences with key family members once a week and ran through the logistics with the 3-4 main family members that would be handling things during the festivities. We wanted our venue to be accessible to everyone, which is why we choose the Marriott O'hare. For the decor, it depended on the event. 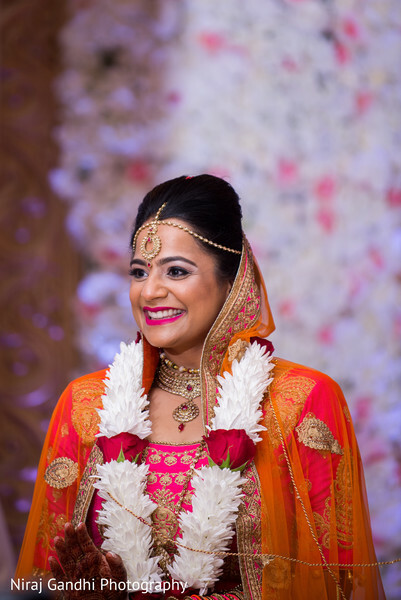 I had always envisioned a bright, colorful, theme for our sangeet night. I wanted the decor and our outfits to reflect that. We wanted the food to remind our guests of Indian Street food, so we had 8 different stations where they could reminisce and indulge. 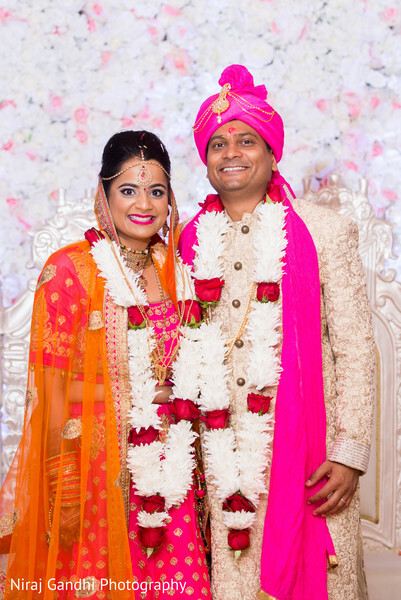 For the wedding I wanted a soothing/relaxing yet elegant look- which is why we did the bright floral pieces down the aisle with the large soft pink and white floral frame behind us. 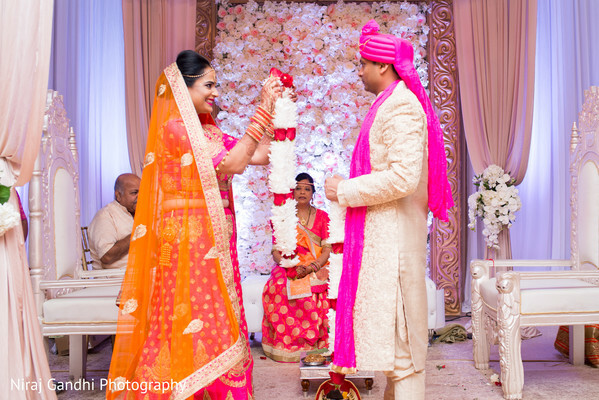 The dome effect on the mandap was the icing on the cake for us! We enhanced our wedding with handmade floral cones (by my sister-in-laws!) for the first few rows as well as cards that explained the rituals on each chair. The reception theme was contemporary romantic; lots of hanging tealight candles and floral centerpieces. We decided to not have a traditional wedding cake, but to have a nitrogen ice cream vendor instead! The guests absolutely loved that. My hair and makeup I left in the hands of my artist- and she delivered! I knew the styles I vaguely wanted but she really went above and beyond. I think working together with Arpit on the planning was awesome. It made me appreciate his organizational skills and also his Microsoft Excel skills! We both made compromises and decisions together-an insight into the fundamental core of our relationship. We were definitely a team and the entire process solidified that to another level. The bright colors, the food, things running on time, and most importantly the energy from our loved ones all weekend. Even our sangeet night felt like a reception with the amount of dancing and hype in the room. It was apparent how much our families were just as excited about our wedding weekend as we were! Yes!! Arpit and I wanted to do a surprise choreographed dance as our first dance. This is really unique because he doesn't dance at all and takes the term 'two left feet' to a whole new level! With that being said, we hired a choreographer and practiced so much for 3 months with her as well as independently. We spent hours perfecting our steps and facial expressions, even if that meant sacrificing sleep! The result was worth all the effort- the looks on our families' and friends' faces were priceless! 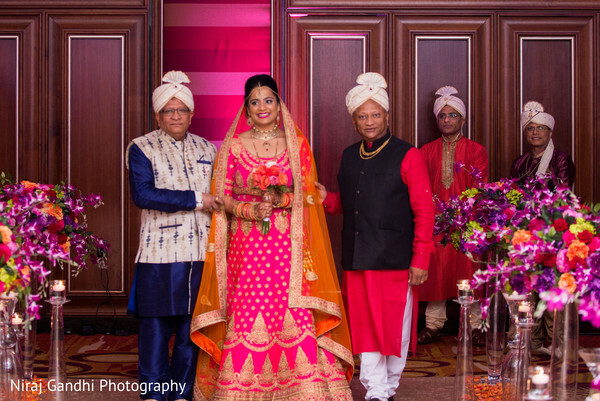 Our pithi was a small ceremony with just immediate family- which was special in and of itself. For our sangeet, we had a "Patel vs. Shah" dance-off. My side of the family did a number of dances and then Arpit's side did. The crowd had to make noise to vote for their favorite side, which was so fun! We also wanted a "Taste of street food in India" theme for our meal. We were able to have quite a few stations that represented different areas of the country. Our family made signs that explained what the dishes were and a map highlighting which part of India the dish was from. We wanted people to eat, drink, and dance the night away! For the cocktail hour before the reception ceremony, we wanted to provide some live entertainment. We were able to have a tabla player that played all of our favorite bollywood and American songs! It was incredible to hear 'despacito' on the tablas followed by 'dhadkan'! As far as the reception, we wanted our guests to dance the night away with us. We kept the speeches to a minimum and had no dances on the reception night- with the exception of our first dance, father/daughter, and mother/son dances. It was so nice to mingle with everyone and just have a big party! We knew people would be hungry around midnight- so we had arranged Taco Bell to deliver 200 of our favorite items to the venue :). Absolutely! Do the best you can with the planning; have excel spreadsheets and timelines. Try to think of everything that is important to you and make sure those things are accounted for. I would assign 2 main people from each side to be extremely involved and make sure they know every little detail. The last thing you want on your wedding weekend is for family/vendors to ask you where things are and what needs to be where. Other family members can be involved too- but don't give them more than 1-2 tasks that entire weekend just to make sure they don't feel overwhelmed or pressured either. I think as much as you plan/organize the events, the unexpected will happen and things will go wrong. Make sure you have a 'damage control squad' for these scenarios that can quickly make decisions and rectify the situation! Also, don't sweat the small things- I promise you that guests won't notice if a centerpiece is wrong or if the color of a tablecloth is off. However, everyone will notice if you are upset at something since you're the bride. Lastly, when the weekend finally arrives, you are done! It is your time to enjoy with family and friends and not worry about a thing. People have travelled from all over the world to be with you and celebrate. This is your special moment, don't forget to enjoy it because it really flies by! Thank you Palav! Reception fun up next with entertainment by Creative Sounds.